Chester Arthur was the 21st President of the United States of America, the symbolic leader of the country. His presidency began in 1881 and ended in 1885. He was 51 years old when he first began his term of office on September 19, 1881. Chester Alan Arthur was named after his paternal grandfather 'Alan Arthur' and the doctor who delivered him 'Dr. Chester Abell'. Some of his family and friends called him 'Chet'. He had a variety of nicknames including Elegant Arthur, Dude President, Prince Arthur and Walrus. The nicknames referred to his reputation as a fashion conscious president who liked to indulge in extravagant luxury. The 'Walrus' nickname referred to his looks and his trademark 'handlebar' moustache. The picture of Chester Arthur portrays an interesting image of what this famous man looked like. The picture shows the clothing and the hairstyle that was fashionable during his presidency. He is described as being 6 feet 2 inches in height, a chubby man, 224 pounds in weight. He had dark colored eyes and his wavy hair was brown that turned gray with age. His appearance was dominated by his trademark 'handlebar' moustache which earned him the 'Walrus' nickname. He enjoyed the best things in life, eating the finest foods and wearing fashionable, expensive clothes. 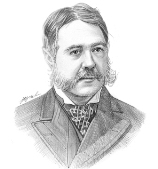 Character and Personality Traits: What was Chester Arthur like? 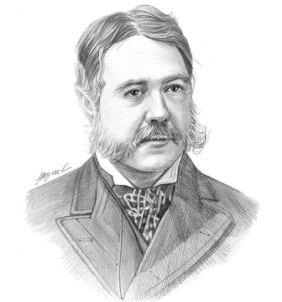 The personality of Chester Arthur is described as gregarious and likeable with a friendly manner. He mixed well with people from different walks of life and was noted for his charm and elegance. He was a compassionate and emotional man who was extremely loyal to his friends. The important role and duties of the President of the United States of America include those of Chief of State, Chief Diplomat, Chief Executive, Commander in Chief, Legislative Leader and Leader of his own political party. What was Chester Arthur famous for? Why was Chester Arthur important? The history and life of President Chester Arthur during his presidency is conveyed in the following fact file in an easy question and answer format. What President was Chester Arthur? He was the 21st President of the United States of America. The dates of his presidency began in 1881 and ended in 1885 (September 19, 1881 to March 3, 1885) . What other political offices did Chester Arthur hold before his presidency? What were the major events and accomplishments of his presidency? What was Chester Arthur' nickname? His most famous nickname was "Elegant Arthur"
Who was Chester Arthur' s first lady? Chester Arthur was famous for the events and accomplishments of his presidency, but what are the facts about the man and his private life. Facts and information about the private life of Chester Arthur can be found in the following fact file in an easy question and answer format. When and where was Chester Arthur born? Where was Chester Arthur educated and what was his religion? What did Chester Arthur do before he became President of the United States? Who was Chester Arthur' wife and when did they marry? Did they have kids? When did Chester Arthur die? We hope that the picture, facts and information on President Chester Arthur will prove helpful to kids, school children and schools learning about the presidency of this famous American leader. The facts about Chester Arthur provides an overview of the President's character and personality traits. Watch the video and learn more about the major events of his life and his accomplishments. The following Chester Arthur video is a useful educational resource for kids, children and schools learning about the life of the US President Chester Arthur.